"Come on! Look at me!" Hmm, I wonder what this episode could possibly be about? Sorry. I try not to start my reviews with sarcasm if I can help it, but I couldn't resist the temptation. After spending so much time in the shadows, the Sinnerman finally makes himself known to us. Or does he? I just can't believe that the man currently in custody is actually the Sinnerman. For someone so renowned, he was captured incredibly quickly. I'm thinking that he's just a lieutenant or something similar. If so, he's a very, very loyal underling. Carving out his own eyes? I was not expecting that, especially on Lucifer, which, even though it regularly deals with murder, really isn't all that gory. It's a great way to get under Lucifer's skin, though. This season has largely been about Lucifer feeling powerless in the face of the Sinnerman's encroaching influence. Lucifer finally thought that he would be able to learn the Sinnerman's weakness, only to be foiled in the worst way possible. Lucifer's obsession with the Sinnerman did have one unexpected side effect: Marcus and Chloe got a lot closer. I haven't been shy about my love for Chloe/Lucifer, so it should be no surprise that I'm not exactly thrilled about this development. I can understand why it's happening, though. Marcus is an attractive guy, he saved Chloe's life, and even though he's a hard and demanding Lieutenant, he still values Chloe and is emotionally vulnerable with her. Honestly, that might just be what sealed the deal in cementing the attraction that Chloe has. He was honest with her and told her about his brother's murder. Lucifer doesn't really do that. That slow motion scene right before Lucifer went to confront the Sinnerman was very telling. He saw that there was something going on between Marcus and Chloe. It registered for a split second as something that he should be worried about. But as soon as he saw that Chloe was leaving with Dan, he's attention was solely focused on the Sinnerman again. It wasn't an immediate issue, so his revenge was more important than his potential love life. Speaking of love lives... Sorry, I know that's an awful transition. But Linda and Amenadiel are officially together! Yay? I won't say that Lucifer hasn't been building towards this all season, because it has. I even commented on the growing tension between the pair. But it still felt weird to me. Maybe the dialogue right before they kissed was just very cringe worthy. Of course, they had to get together right when Maze finally(!!!!!) returns from bounty hunting. Maze is not pleased by the implication that her best friend and her ex are together, and it's understandable. We've all been in a similar situation. Despite Maze's denials, Amenadiel was obviously special to her as a romantic partner, and it's obvious how much she cares about Linda. I did really like how Maze went to Linda to talk about how she felt. It was one of the more emotionally moving scenes, and really showed just how much Maze has grown as a person... demon... whatever. Too bad Linda and Amenadiel had already gotten together. The way that Lucifer carries out his favors is very interesting. He doesn't automatically give you what you want. He just makes an introduction or two. You need to be able to make the most of it. Apparently, Lucifer has to be able to make direct eye contact in order to use his superpower. Did we know that? Maze is now banned from Ohio. I really want a miniseries devoted solely to why exactly Maze is banned from so many places. Linda's question about why the angels have their specific powers was a good one. I wanted a better answer. Have I mentioned lately how much I love the music on this show? Because I love it. A lot. Bouncer: This is a one. Linda: Can't a woman be friends with a brilliant, tall, gorgeous angel? Amenadiel: Well, can't an angel be friends with an amazing, accomplished, beautiful, passionate woman? Linda: So why is your gift desire? Lucifer: That's a good question, actually. I suppose, when I first went to angel school, they sorted us into different houses for different powers. Linda: There's a school for angels? Lucifer: No. No, there's no Hogwarts in the sky. I really, really liked this one. It was fun, and we got some forward momentum on the season's arc. I'm now 70% sure Marcus is the real Sinnerman. That ending was so confusing. It seems pretty obvious that the guy isn't Sinnerman, but what could have possibly compelled him to do what he did to his eyes? 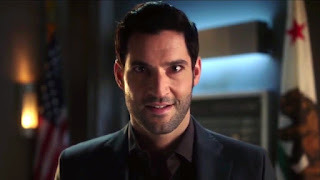 Billie Doux, well, if he's working for the real Sinnerman and wants to keep fooling everyone, letting Lucifer know what he's desire was would probably have revealed him as a fake and ruin whatever the Sinnerman's plan is. So he did the only thing he could have done short of killing himself or betraying the Sinnerman (which would probably get him killed anyway). Hmmm, I'd guess he IS a real Sinnerman. Yes, the way he was captured wasn't exactly subtle, but on the other hand this show is not known for being too subtle. But how did he know? He clearly wasn't just playing along with Lucifer's “metaphor“, with all that reinforced steel stuff. Does he know Charlotte used to be the host of Mom? Does he know she isn't anymore? What, no comments on Maze's hair? I didn't even recognize her at first. Also, I kept expecting the reveal that Amenadiel is somewhere in Linda's office during that girl talk. I loved the Dan / Charlotte scene in the men's room. Poignant and funny.